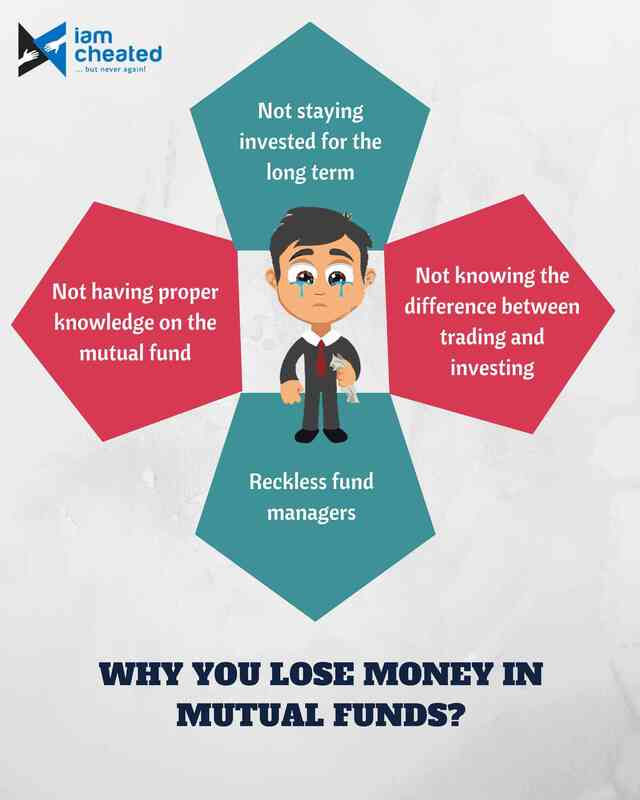 Why You Lose Money In Mutual Funds? You don't always lose money by investing in mutual funds. If you have lost money in mutual funds, this might be because you have not followed the rules which you were supposed to follow. In this blog, we will discuss various reasons why people lose their money in mutual funds. You won't be able to earn good returns on Mutual Funds if you do not stay invested for long periods of time. According to investment experts, to earn good returns on equity mutual funds, you must stay invested for at least three years or more. You should never panic and exit at the wrong time, because of temporary market volatility conditions. It is very important to have a timeframe for investment. Doing so will help you choose the right product and reach your financial goals in a planned manner. Many people invest in mutual funds, without having proper knowledge on the product. If you do not have proper knowledge on the mutual fund, you might end up investing in the product which does not give you, the desired returns. Also, not having proper knowledge on when to enter and exit from the mutual fund can impact your portfolio. Many people do not know the difference between trading and investing. Trading is a method of holding stocks for a short period of time. It is done to achieve short-term gains from the share market. Under investing, investors put money for a longer period of time, to achieve long-term goals. Mutual funds are not suitable for trading. You are required to invest rather than trade. There are high chances of losing your money if you trade in mutual funds. Fund managers are the people who are appointed by your fund houses, to deal with your money. Fund managers are well-trained and are known for excellent investment practices. But, there are some fund managers who make careless decisions, causing you to suffer a heavy loss. So, before investing your money in mutual funds, you must do proper research on the fund manager.